Treasury closed the financial books on fiscal 2014 last week. As my colleague Howard Gleckman noted, the top line figures all came in close to their 40-year averages. The $483 billion deficit was about 2.8 percent of gross domestic product, for example, slightly below the 3.2 percent average of the past four decades. Tax revenues clocked in at 17.5 percent of GDP, a smidgen above their 17.3 percent 40-year average. And spending was 20.3 percent, a bit below its 20.5 percent average. Taxes, spending, and deficits thus appear to be back to “normal.” If anything, fiscal policy in 2014 was slightly tighter than the average of the past four decades. That’s all true, as a matter of arithmetic. But should we use the past 40 years as a benchmark for normal budget policy? It’s common to do so. The Congressional Budget Office often reports 40-year averages to help put budget figures in context. I’ve invoked 40-year averages as much as anyone. But what has been the result of that “normal” policy? From 1975 to today, the federal debt swelled from less than 25 percent of GDP to more than 70 percent. I don’t think many people would view that as normal. Or maybe it is normal, but not in a good way. Just before the Great Recession, the federal debt was only 35 percent of GDP. Over the previous four decades (1968 through 2007), the deficit had averaged 2.3 percent of GDP, almost a percentage point lower than today’s 40-year average. That comparison illustrates the problem with mechanically using 40-year averages as a benchmark for normal. A few extreme years can skew the figures. In 2007, we would have said deficits around 2 percent of GDP were normal. Today, the post-Great Recession average tempts us to think of 3 percent as normal. The Great Recession has similarly skewed up average spending (from 19.9 percent to 20.5 percent) and skewed down average taxes (from 17.6 percent to 17.3 percent). As recent years demonstrate, we don’t want a normal budget every year. When the economy is weak, it makes sense for taxes to fall and spending and deficits to rise. When the economy is strong, deficits should come down, perhaps even disappear, through a mix of higher revenues and lower spending. Looking over the business cycle, however, it is useful to have some budget benchmarks. A mechanical calculation of 40-year averages won’t serve. Instead, we need more objective benchmarks. On Twitter, Brad Delong suggested one benchmark for deficits: the level that would keep the debt-to-GDP ratio constant. I welcome other suggestions. At 8:30 this morning, Uncle Sam suddenly shrunk. Federal spending fell from 21.5 percent of gross domestic product to 20.8 percent, while taxes declined from 17.5 percent to 16.9 percent. To be clear, the government is spending and collecting just as much as it did yesterday. But we now know that the U.S. economy is bigger than we thought. GDP totaled $16.2 trillion in 2012, for example, about $560 billion larger than the Bureau of Economic Analysis previously estimated. That 3.6 percent boost reflects the Bureau’s new accounting system, which now treats research and development and artistic creation as investments rather than immediate expenses. In the days and months ahead, analysts will sort through these and other revisions (which stretch back to 1929) to see how they change our understanding of America’s economic history. But one effect is already clear: the federal budget is smaller, relative to the economy, than previously thought. The public debt, for example, was on track to hit 75 percent of GDP at year’s end; that figure is now 72.5 percent. Taxes had averaged about 18 percent of GDP over the past four decades; now that figure is about 17.5 percent. Average spending similarly got marked down from 21 percent of GDP to about 20.5 percent. These changes have no direct practical effect—federal programs and tax collections are percolating along just as before. But they will change how we talk about the federal budget. 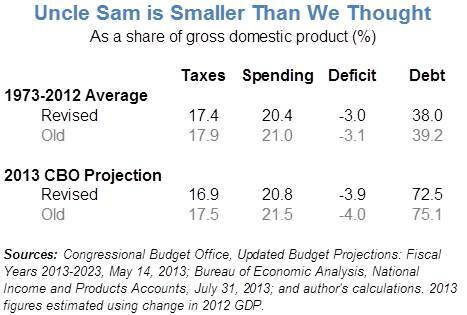 Measured against an economy that is bigger than we thought, Uncle Sam now appears slightly smaller. Wonks need to update their budget talking points accordingly. What’s the Mix of Spending and Revenue in the President’s Deficit Reduction Proposal? 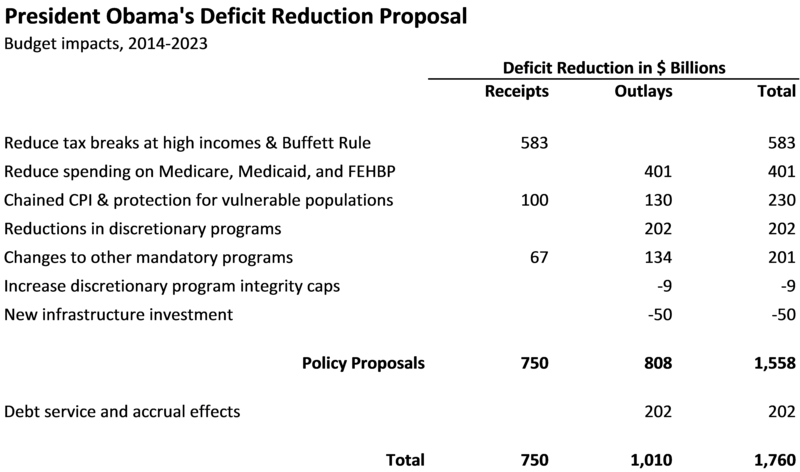 President Obama’s budget identifies a group of policies as a $1.8 trillion deficit reduction proposal. I found the budget presentation of this proposal somewhat confusing; in particular, it is difficult to see how much deficit reduction the president wants to do through spending cuts versus revenue increases. The proposal would increase revenue by $750 billion over the next decade. Much media coverage has been incorrectly suggesting an increase of either $580 billion (revenue from limiting tax breaks for high-income taxpayers and implementing a “Buffett Rule”) or $680 billion (adding in the revenue that would come from using chained CPI to index parameters in the tax code). But there’s another $67 billion in additional revenue. Almost $47 billion would come from greater funding for IRS enforcement efforts that lead to higher collections. To get that funding, Congress must raise something known as a “program integrity cap.” The administration thus lists this as a spending policy, but the budget impact shows up as higher revenues (assuming it works—such spend-money-to-make-money proposals don’t always go as well as claimed, although there is evidence that IRS ones can). Several similar administrative changes in Social Security and unemployment insurance add almost $1 billion more. Another $20 billion would come from increasing federal employee contributions to pension plans. That sounds like a compensation cut to me and, I bet, to affected workers, and would be implemented through spending legislation. Under official budget accounting rules, however, it shows up as extra revenue as well. In total, then, “spending” policies would generate more than $67 billion in new revenue. Taken as a whole, the president’s deficit reduction proposal includes $750 billion in revenue increases, $808 billion in programmatic spending cuts, and $202 billion in associated debt service savings. The proposal thus involves about $1.1 in programmatic spending cuts for every $1 of additional revenue. At least according to traditional budget accounting. If you believe (as I do) that many tax breaks are effectively spending in disguise, the ratio of spending cuts to tax increases looks much higher. From that perspective, much of the $529 billion that the president would raise by limiting deductions, exemptions, and exclusions for high-income taxpayers should really be viewed as a broadly-defined spending cut. I haven’t had a chance to estimate how much of that really is cutting hidden spending, but even if only three-quarters is, the ratio of broadly-defined spending cuts to tax increases would be 3.5-to-1. September brings the change of seasons. Football players return to the gridiron. New television programs replace summer reruns. In Washington, legislators gear up for another season of legislative brinkmanship. What distinguishes such brinkmanship from ordinary legislating? Hard deadlines. Such deadlines force Congress to address policy issues that might otherwise languish due to partisan differences or legislative inertia. Last spring, for example, the repeated threat of a government shutdown forced Congress to decide how much to spend on government agencies in fiscal 2011. This summer, the debt limit forced Republicans and Democrats to reach a budget compromise before Aug. 3, the day we would have discovered what happens if America can’t pay all its bills. Hard deadlines thus can force Congress to address major issues. But they also invite that brinkmanship. Like students who put off writing term papers until the night before they’re due, legislators often drag out negotiations until the very end. As we saw with the debt-limit debate, the ensuing uncertainty – will the United States really default? – can damage consumer, business, and international confidence. Hard deadlines also give leverage to those legislators who are least concerned about going over the brink. So get ready for the new season. The fall legislative season is full of deadlines that could invite such brinkmanship. Here are five. Sept. 30 also marks the end of the fiscal year – an especially important deadline. Congress has made woefully little progress in deciding next year’s funding. So we again face the prospect of temporary funding bills being negotiated in the shadow of threatened government shutdowns. The fourth deadline comes on Nov. 23, the day the new “super committee” has to deliver a plan to address government debt and cut the deficit by at least $1.2 trillion over the next decade. If any seven committee members agree by that date, their plan will get special, expedited consideration in the House and Senate. If the committee fails to reach agreement or Congress fails to enact it by Dec. 23, however, then automatic budget cuts go into effect for a range of programs, including defense, domestic programs, and Medicare, starting in 2013. A final deadline comes at the end of the year, when several economic initiatives are set to expire, including the 2 percent payroll tax holiday and extended unemployment insurance benefits. Each of these deadlines will command congressional attention. The downside of inaction will be tangible and visible. With renewed concern about jobs, policymakers will feel extra pressure to continue any funding or tax cuts that can be directly linked to employment. These deadline-driven policy issues will thus dominate the fall legislative season. That will leave little space for any new initiatives that don’t come with a deadline. The developed world is awash in sovereign debt. Greece stands on the precipice of painful (and inevitable) default. Italy and Spain struggle to convince markets that their debts are good. Portugal and Ireland hope to get in the lifeboat with Italy and Spain, rather than drown with Greece. And then there’s the United States. Much further from a sovereign crisis than many Euro nations, but still on a worrisome long-term path of spiraling debt. On Tuesday, the Committee for a Responsible Federal Budget released a letter signed by a group of former government officials, budget experts, and business leaders (including me) urging the Joint Select Committee, aka the super committee, “to ‘go big’ and develop a large-scale debt reduction package sufficient to stabilize the debt as a share of the economy.” A group of 38 senators followed with a similar letter, and a host of people made this argument at the super committee’s first hearing. The same day, Mario Blejer–who led Argentina’s central bank after its default–urged Greece to go big: “Greece should default, and default big. A small default is worse than a big default and also worse than no default,” he said in an interview reported by Reuters Eliana Raszewski and Camila Russo. So there you have it. If you find yourself at a loss for words in a weekend discussion about sovereign debt, you know what to say: Go big. Or, if you are contrary sort, go small. Either way, you can keep the conversation going.